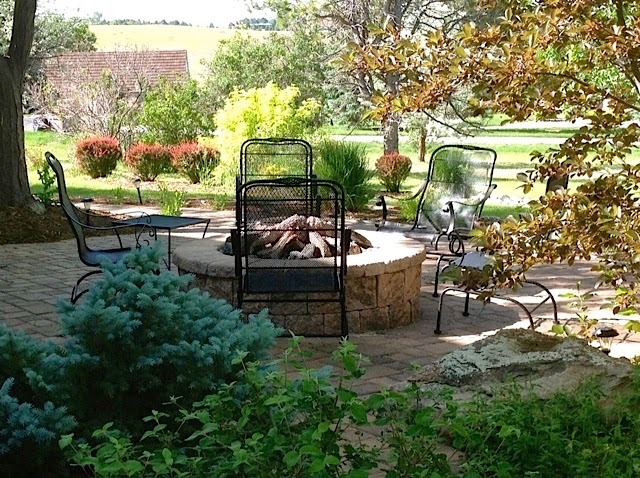 When I visit my sister, we sometimes sit around the fire pit in the evenings to visit and possibly to even enjoy a S'more. Have you shared a S'more with someone this summer? 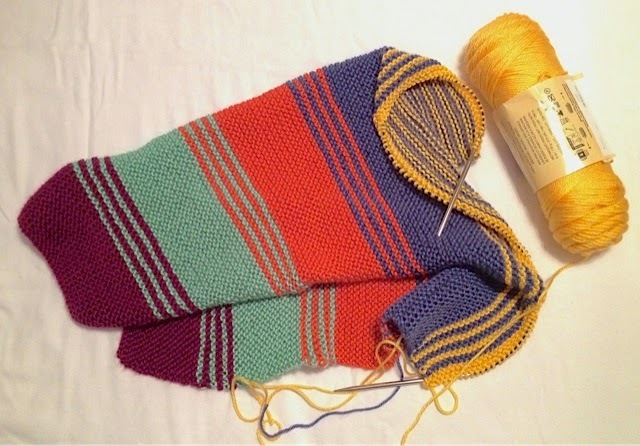 I chose colors from my stash that closely match those used in the pattern. This preemie blanket posted on the needles last week is now complete. 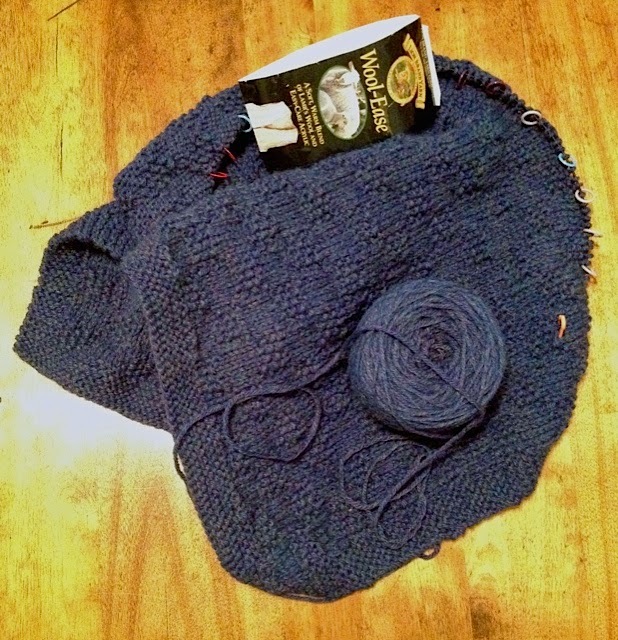 Last week's photo more closely captured the true color of the yarn called Blue Mist #115 (Lion Brand Wool-Ease). Yes, both of these blankets were knit with the same yarn, but as mentioned above, it was difficult photograph. The yarn is a tweed - pink, purple, royal blue, and navy blue. 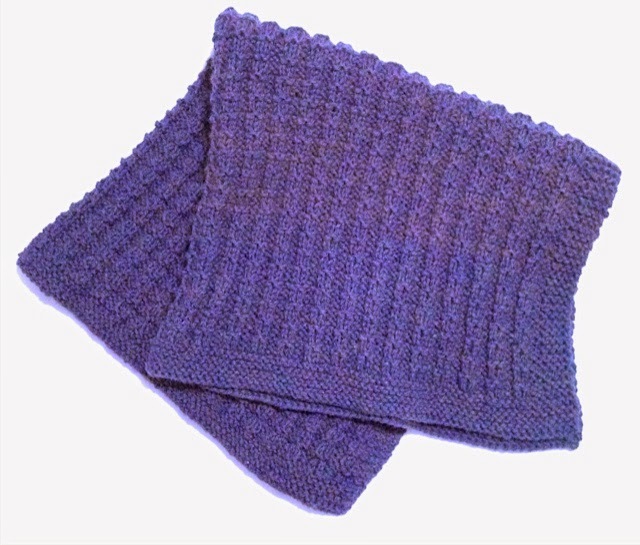 Mary sent six skeins of the Blue Mist yarn that was used to create these two blankets which will be sent to the Pine Ridge Reservation Project. The Three Dude's Blocks were used to create another Quilt of Valor that I named, Kaleidoscope. I loved playing with a kaleidoscope when I was young, seeing all the beautiful colors turning into unique designs. 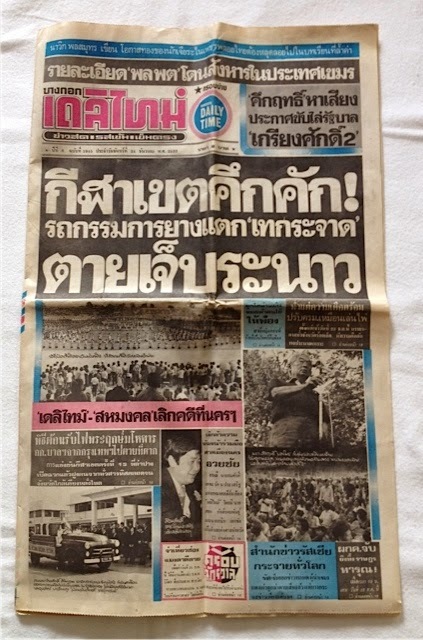 I cannot read a word in this paper, but I thought the written Thai language was beautiful and wanted to take a bit of it home with me. The paper was purchased from a street vendor next to a photography shop. 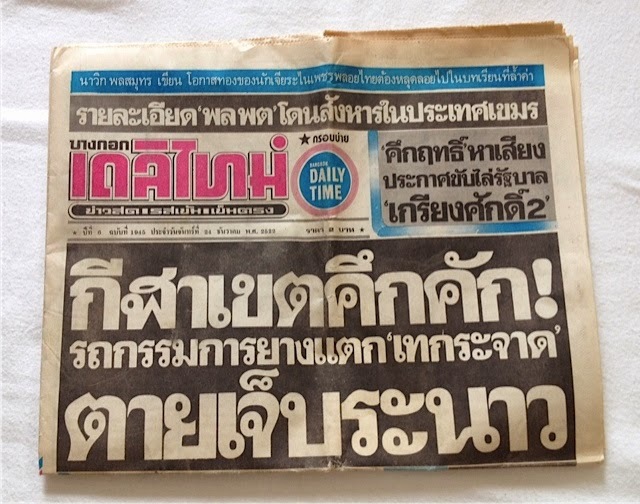 I suppose the vendor wondered why a lady who did not speak Thai wanted a newspaper. For some reason, it is difficult for me to put this in the recycle bin. Oddly, I did not purchase a Japanese newspaper, but I did purchase one in Taiwan. 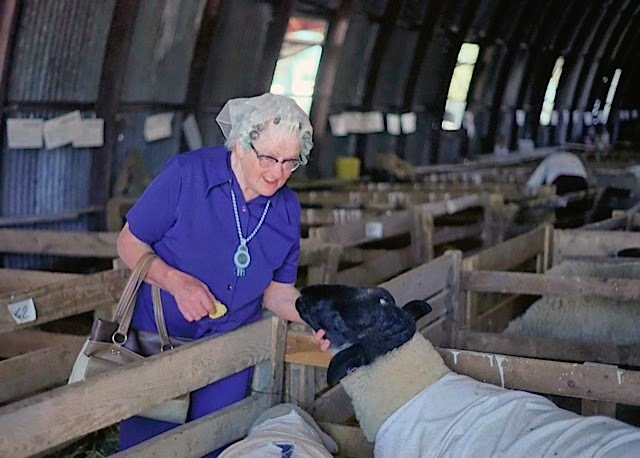 My mother loved touring the animal barns at the County Fair, and of course, some of the animals appreciated the rubs and scratches she gave them. Mom must have had something special planned for the evening because she has her hair in curlers. (Remember the brush curlers that were secured with pink pins?) She is shown in the following photo with two grandchildren, my sister Marilyn's children. They came to Wyoming during the summer to work on Grandma Rosie's farm for a few years. 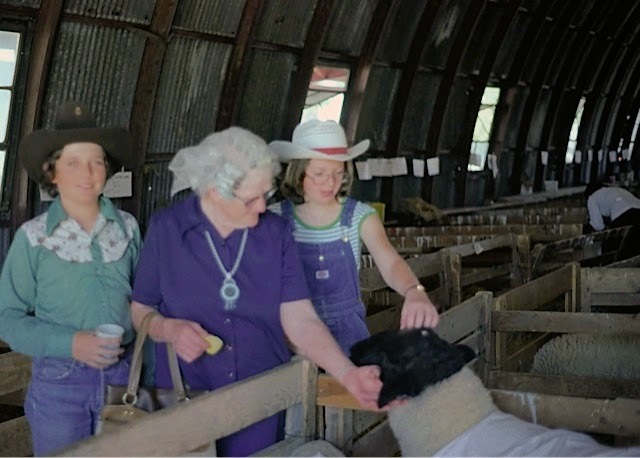 Dwight M., Grandma Rosie, Brenda M.
The County Fair starts next week, and I'll make the circuit through the animal barns offering scratches and ear rubs - the cycle continues. Do you visit the animal barns when you go to the fair? 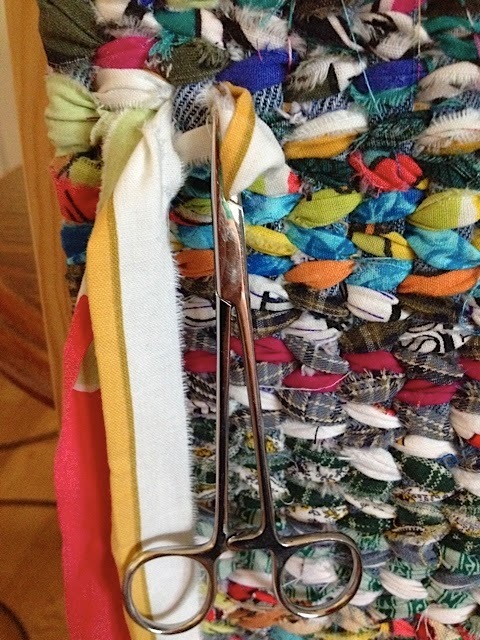 At the end of Mondays post, I said that scrap-busting was happening in my sewing room. It seems like all I do anymore is create more scraps, so I simply must get the scraps under control before cutting into any new fabric. Some of my scraps are 2.5 inch strips that were cut from excess backing fabric of previous Quilts of Valor and others small bits remaining from other blocks. I love the video tutorials of the Missouri Star Quilt Company (MSQC), and if you've never watched any of them, you really should. Most of the projects are new-quilter friendly. This particular block came from the Three Dudes Quilt Shop in Arizona. MSQC created a video on how to make the block, believe me it is easy and uses a LOT of scraps. (For non-quilters, a Jelly Roll, is a roll of 2.5 inch strips from one fabric line.) For my blocks, I simply used 2.5 inch strips. 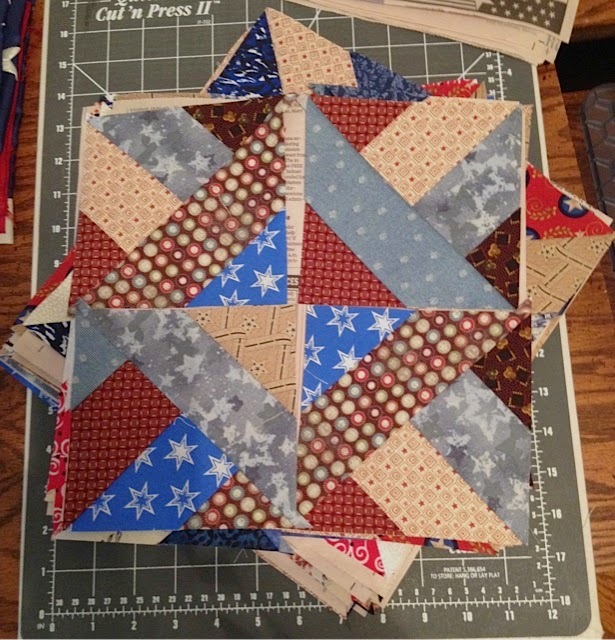 I hope to show you some progress on these blocks and this Quilt of Valor by next week. Yes, I Still Knit. . . 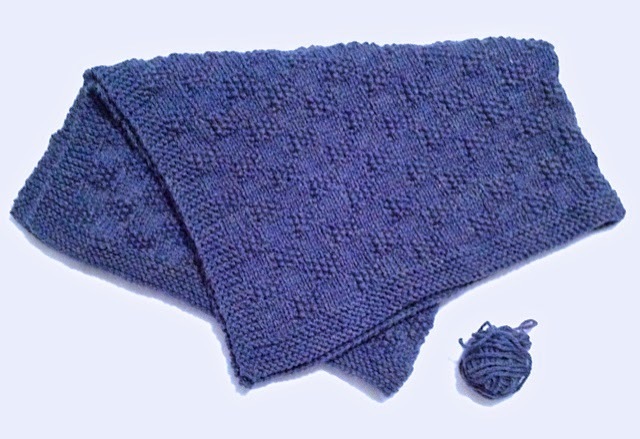 Yes, I still knit, but for some reason, my knitting has slowed considerably this summer. 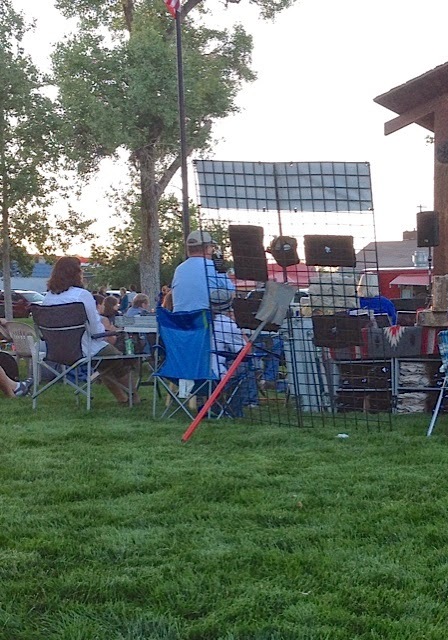 I have a "grab and go" bag that I take to evening concerts in the park and at the library, but that knitting is strictly dishcloths because I can visit and tap my foot to the beat without needing to concentrate on my knitting. You will notice that I'm using multiple markers on this blanket. They aren't really necessary, but they are a good reminder for me to pay attention to my stitches on the wrong side rows. A month ago, Mary sent me a bunch of yarn, and this blanket is being knit with some of it. This blanket will be donated to the Pine Ridge Reservation Project. Thank you, Mary for making this and other blankets possible for this impoverished area. 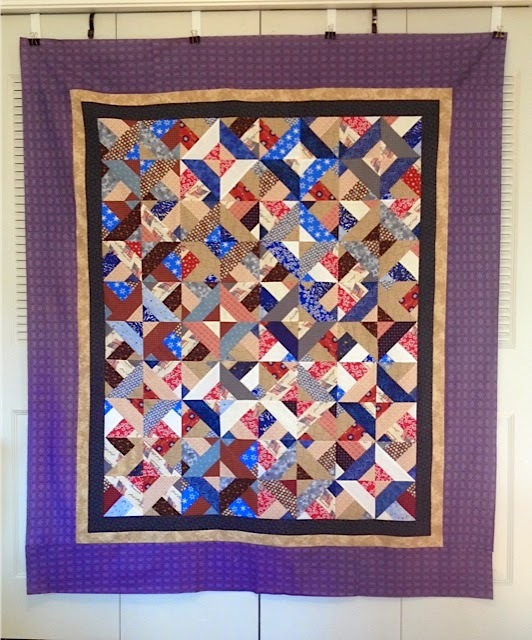 The stars and sawtooth border of this quilt were made entirely from scraps of other Quilts of Valor; thus, the name Calico Stars. 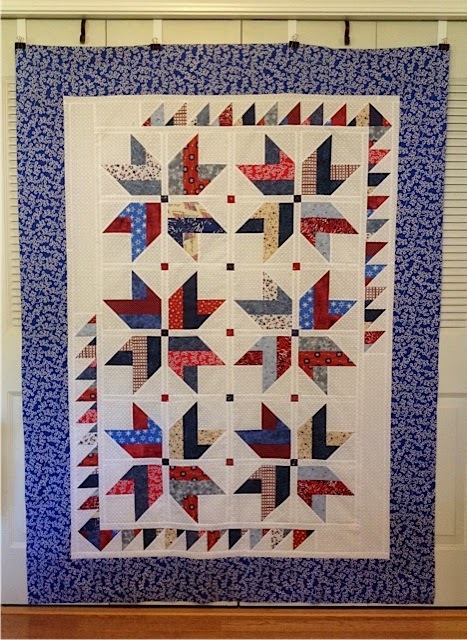 I loved working with this pattern (Stars from Stripes) by Cozy Quilt Designs because making the stars did not result in creating more scraps, i.e. no waste. The tips that were cut off to create the stars were used to create the sawtooth border. I did make an adjustment in the placement of the sawtooth border and extended the final border to 6.5 inches instead of the suggested 5.5 inches in order to meet Quilt of Valor minimum size standards. 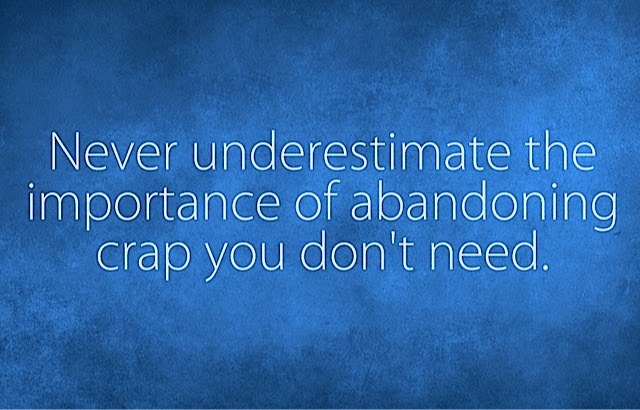 I'm on a mission to reduce my scraps, so stay tuned for even more scrap busting. One evening our tour group visited a small sake and sushi bar. 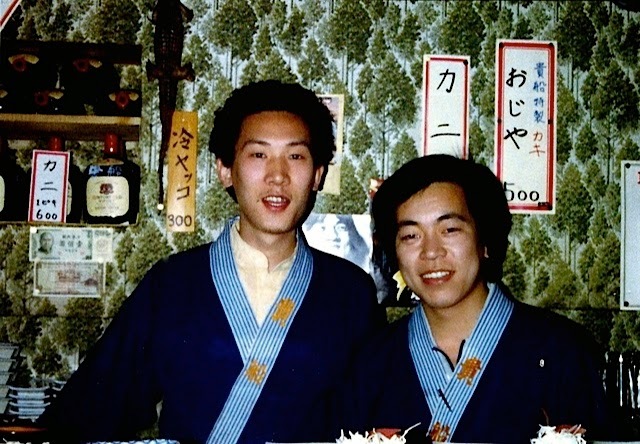 The two guys in the photo entertained our group and served us all kinds of sake: some was served warm and in wooden cups. I still have one of the wooden cups but use it for trinkets. Sake is quite strong and can sneak up on you, so make sure you have a designated driver. Our group ate a variety of sushi at this bar, too. One of the most memorable appetizers we had was horse meat, sliced very thin and marinated in some kind of sauce. Have you tried Sake? Did you like it? 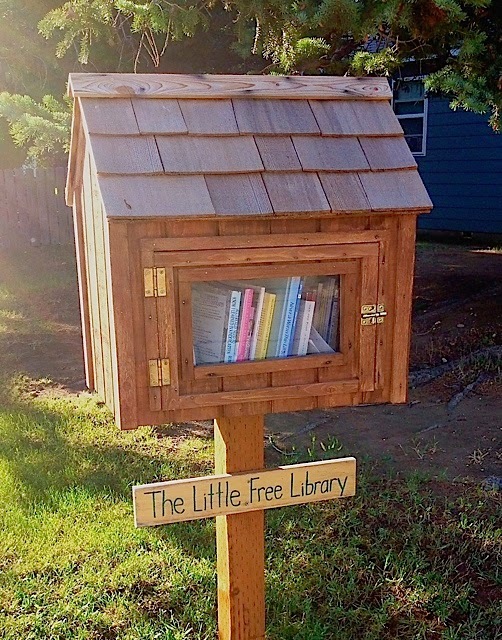 Several years ago I read an article about the Little Libraries, but until last week, I had never seen one. Heading home from the Lander Medical Clinic, I was surprised to find this library on the east side of Buena Vista Drive. It stands under a large pine tree between two houses. The little box actually held more books than I thought was possible: inside was a nice variety of adult, children, and teen books. The slips of paper have notes of appreciation to the family that sponsors the Little Free Library. The Little Free Library project is world-wide. Want to find a Little Library in your area? Use this map. 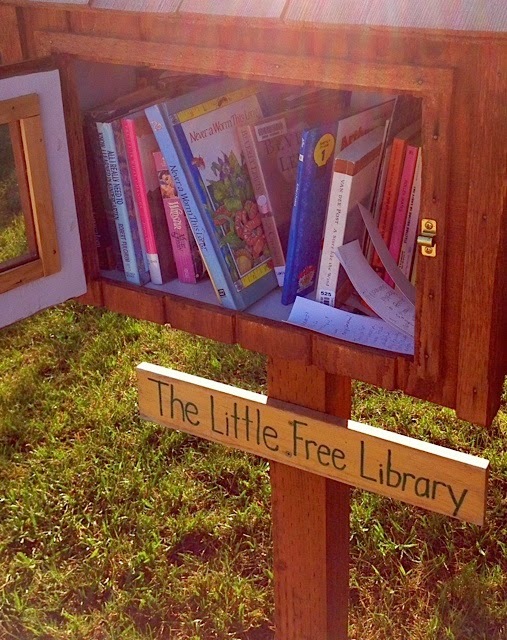 Have you seen or used any Little Free Libraries in your area? Last year in a box filled with old bank statements and cancelled checks, I found this calendar picture that my mother saved. Our dairy herd (those that we milked) were kept in the corral and only the dry and/or pregnant cows/heifers were placed on pasture. It was important to keep the diet of the milking cows consistent because "green" feed affects the milk quality. Green feed can also cause bloat, which can be deadly. Sometimes, but not often, the dairy herd escaped the corral. I always dreaded hearing, "the cows are out!" At those times, it was all hands on deck until the cows were back in the corral. Anyone who's worked with cattle will tell you that cows seem to be blind to an open gate when you want them to go through it; yet when you want them to stay in an area, they will dart through an open gate without being provoked. 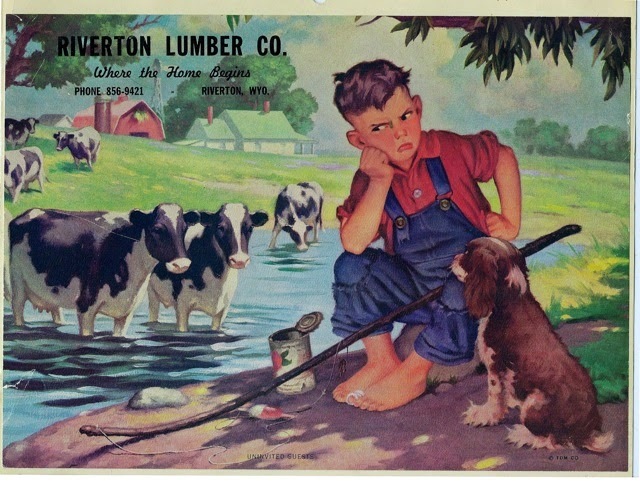 We always had a bull in the corral with the cows, and he presented an entirely different problem. In my opinion, dairy bulls are some of the most vicious and dangerous animals, and I tried to give them a wide berth whenever I could. We once had a bull that did not like my Mother, and whenever he got out of the corral, he would come to the house, looking for her. Before he was rounded up, he tore clothes off of the clothes line and led my brother on a wild chase in the field south of the house. 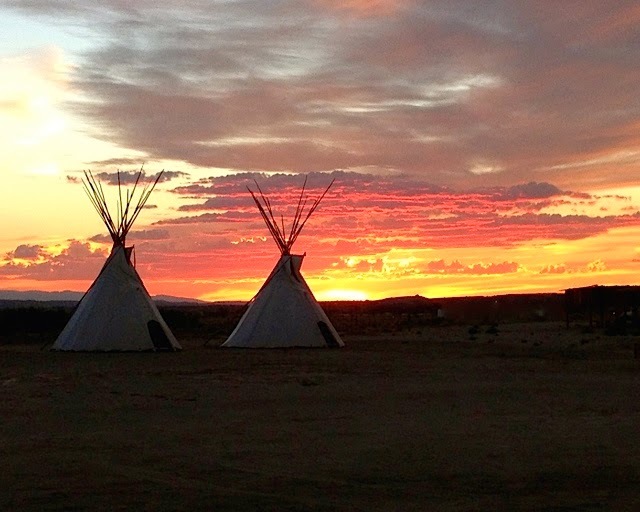 This breath-taking scene was captured with my cell phone at the Wind River Casino. Nancy photographed the same sunset some 15 miles to the west. 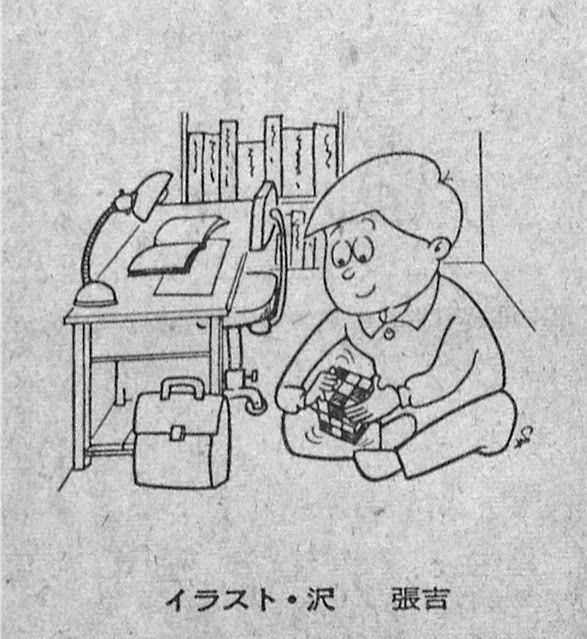 This cartoon from a Taiwanese newspaper illustrates that Rubik's cube was popular in 1979. I don't have a clue what the caption says. 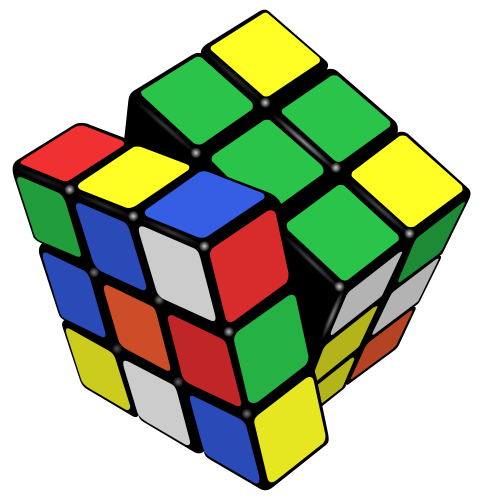 Even though I spent hours twisting this way and that, I never could solve the cube: could you? 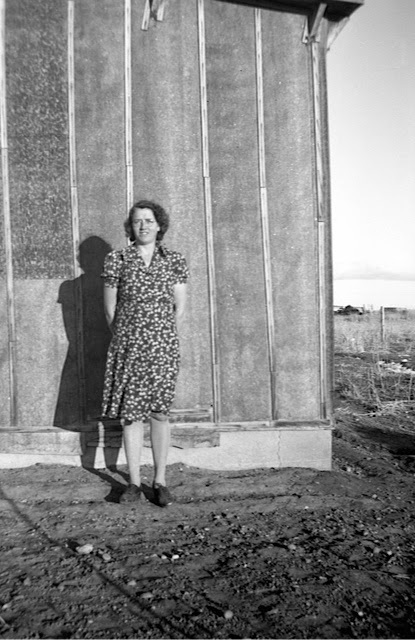 Based on the height of this building, I am guessing that the photo was taken at the Reclamation Hall, located on the northwest corner of Pavillion, in an area that came to be called Camp. Midvale Irrigation headquarters was in the Camp area as were several houses for employees. The Reclamation Hall was used for meetings, dances, potluck dinners, and other community gatherings. I remember attending Farmer's Union meetings and camps in the Hall as well as playing Hide and Seek and Annie Annie Over outside the building. The guest performer that night had several items for sale, and the wire display grid was held in place by a shovel - simple, clever, and effective. Two weeks ago a young woman left a slip of paper on my front door. She was organizing a Block Yard Sale and wanted to know if any of the neighbors would be interested. I contacted my next-door neighbor to see if she wanted to bring her things to my garage for a sale. The lady across the street asked to join us, and I invited two other ladies to bring their things as well. I spent last week pricing my items and preparing my garage (covering the items along the walls, sweeping, and finding tables) for the sale. I've lived in this house for 20+ years, and I have a LOT of stuff that I do not need. Earlier this year, I hauled two packed car loads to the Casper Salvation Army Store, donated cookbooks to the local library for their sale, and tossed things that no one would want. My down-sizing efforts are beginning to make a difference, and no objects have escaped this process: I've even scanned old photographs and sent the originals to my nieces and nephews. How do you deal with excess "stuff"? I Get By. . . 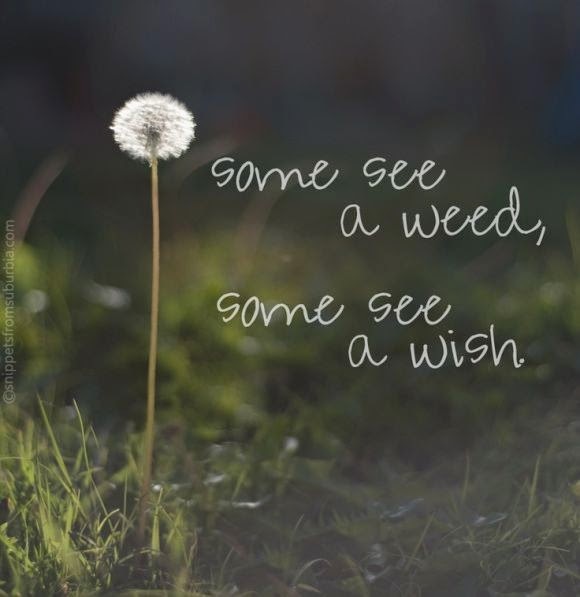 Sometimes my blog posts originate from a photo or a memory. 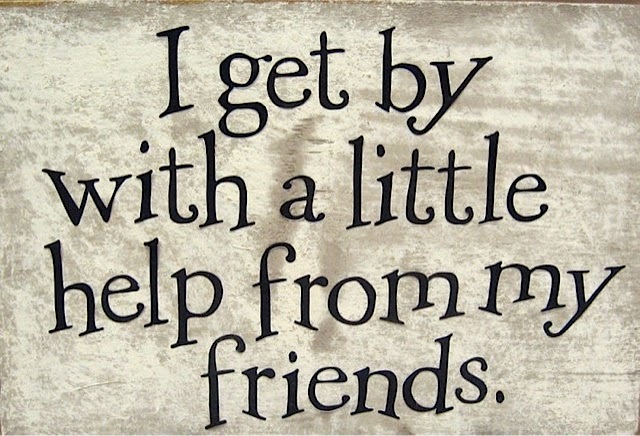 Recently the Beatles' tune, "With a little help from my friends" has been popping into my head. In recent years, I have been blessed with some help from local and cyber-land friends. Marie helped translate a German phrase for my niece who was transcribing her grandmother's diaries. I know that many individuals are afraid to comment and/or to open themselves up to other bloggers. While a chance of finding some unsavory individuals does exist, an opportunity to find many wonderful friends is more likely. I've had the pleasure of meeting some blogging friends: Sara and Julia, Bev and Lori and look forward to meeting many more. Do you have a cyber-friend story to share? 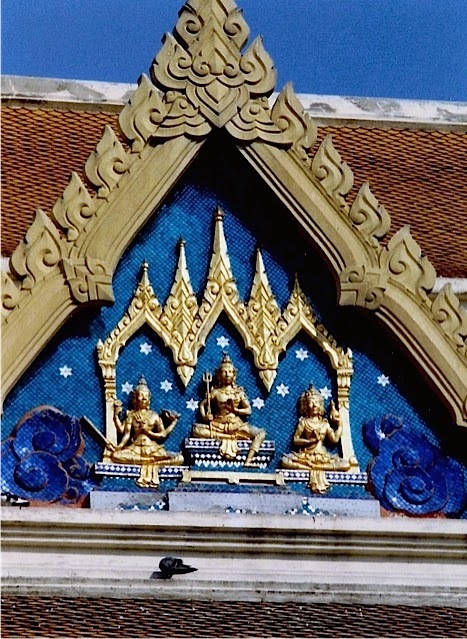 The temple (Wat Traimit) which houses the Golden Buddha has been rebuilt since the tour I took in 1979. 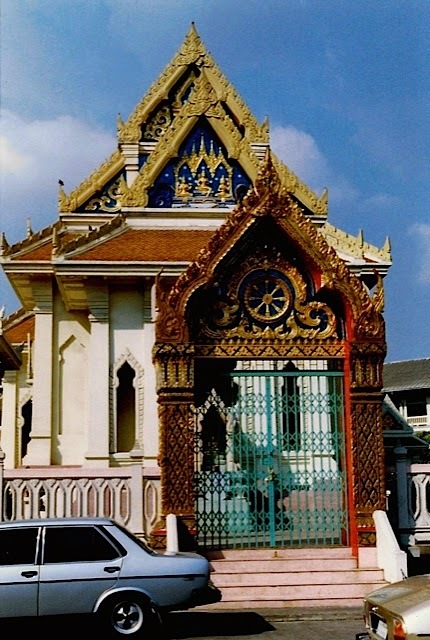 The building then was somewhat nondescript, yet a bit ornate. As seen in this photo, the new building is by far more elaborate. 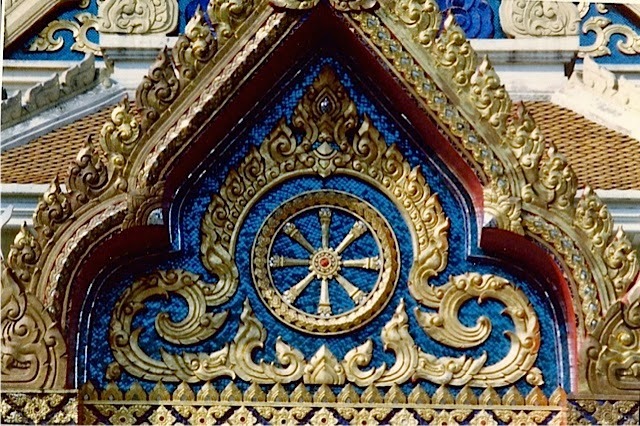 The solid gold Buddha can be seen in this post. 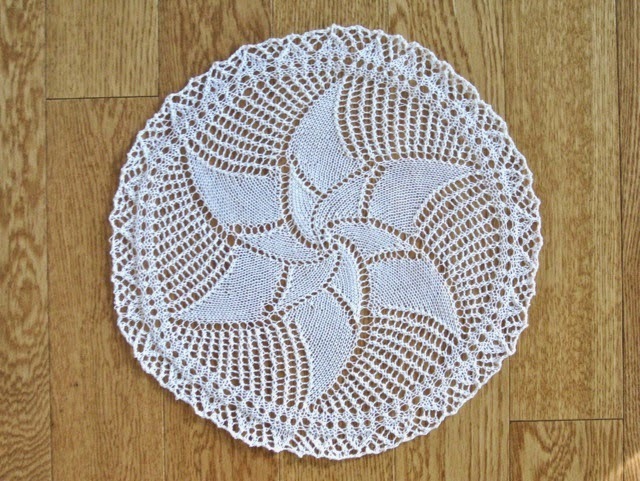 Before I began blocking Susan's doilies (see yesterday's post), I decided to practice her techniques using the doily I knit last year for the County Fair. My efforts last year, resulted in an 11.5 inch doily, but using Susan's blocking circle, I was able to block it to 13.5 inches. What a difference more blocking has made. 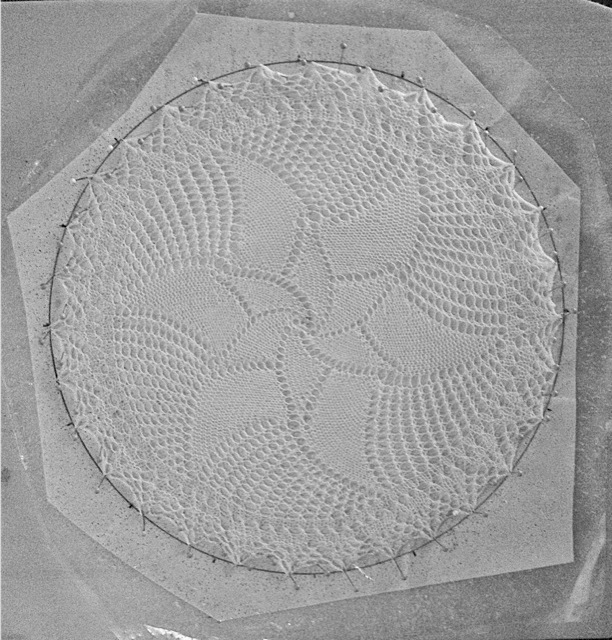 I am much happier with the doily now. Seeing the difference the blocking made, makes me eager to knit another doily soon.